Nature is the heart of Innsbrook. We're dedicated to conserving and enhancing the natural beauty that surrounds us. Without Innsbrook's lakes, streams, woods, meadows and the plants and animals that live within them, our community wouldn't be the natural paradise it is. We take our commitment to nature seriously. Our knowledgeable and dedicated staff is always working and thinking of ways to help conserve and improve Innsbrook's natural beauty. 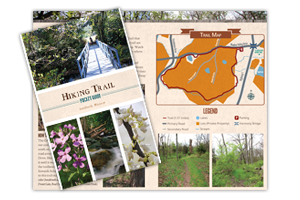 Get out and explore Innsbrook's natural beauty on one of our seven hiking trails, plus learn more in our new Hiking Trail Pocket Guide, including a quick reference guide to nature at Innsbrook! On Monday, August 23, 1999, the Innsbrook Resort Community became the first business of its kind in the continental United States to be certified as a cooperative sanctuary by Audubon International and we continue to maintain a conservation program. For more information about Innsbrook's Conservation Program, please call Keith at 636.928.3366 x9178 or email keith.thompson@innsbrook-resort.com.